First off, let me say... MAY THE FOURTH BE WITH YOU!!! :-) Oh how I love to say that every year! It was stinkin hot today! Over 90, that's too much too soon, take it back, I want spring again! 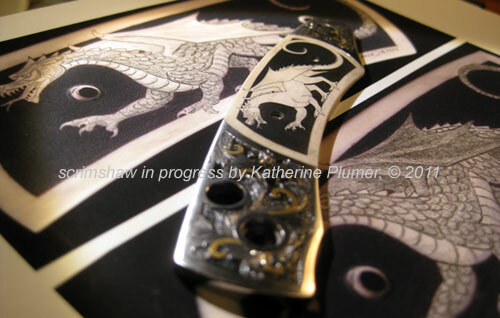 So, after completing the background on the dragon knife (it's darn near solid black, and soooo many engraved dots that the background is actually somewhat relieved now (no, not like sigh of relief, but lower than the surface relief), love it!) it was "back to the drawing board" so to speak. In case you haven't figured this out, I opted for a black and white design. 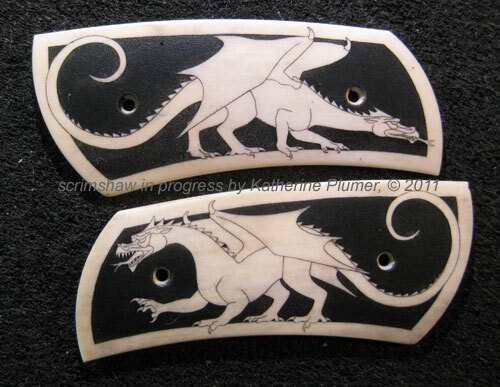 It either had to be color dragons on white or b/w dragons on black, and I think this way has so much more "pop." So I knew the background would be black, but I've been pondering all along exactly what I'd do with the dragon. I have to actually put it on paper to figure it out, and this is where I love photoshop. I scan it, enlarge it, print it out, and work on it with pencils. 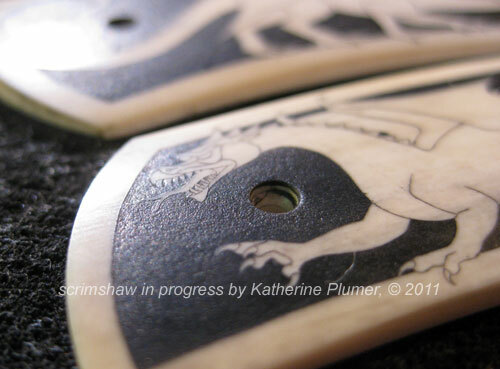 See, there's no erasing scrimshaw, there is zero room for error, so I have to be exactly sure what I want to achieve before the needle hits the ivory. So, deciding part way though the piece how to scrim the dragons is about as close to flying by the seat of my pants as I'll get. It's gonna look awesome!